It’s a Birthday Miracle + a healthy snack! Yesterday, on my birthday’s eve, I got a mysterious package in the mail. I picked that polka dotted envelope out of the squiggly wiggly paper stuff and it was from Joy the Baker! Talk about a birthday miracle! 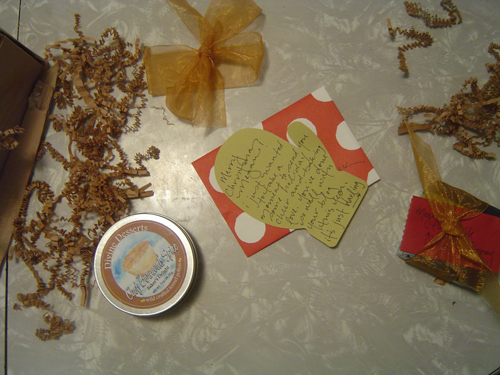 Evidently it happened like this: my mom was all, “Hey Joy, my daughter thinks you’re totally cool and stuff.” Next thing I know Joy sent me a magical fennel pollen spice remix and a card shaped like the state that I live in. She even included a little treasure for my mom. So there you go guys! Things happen! And I am still really excited about it! So now since it’s my birthday, and Jake said that I can’t make my own cake; he treated me to a Sleeping Beauty (an individual bumpy cake) and took me shopping for the perfect winter dress. On another note, if you’re feeling snacky, but you feel kinda gross about all the holiday cookies and meal splurges, simply make some Pumpkin Spice Granola, and eat it like you mean it. Don’t bother feeling guilty about it either. 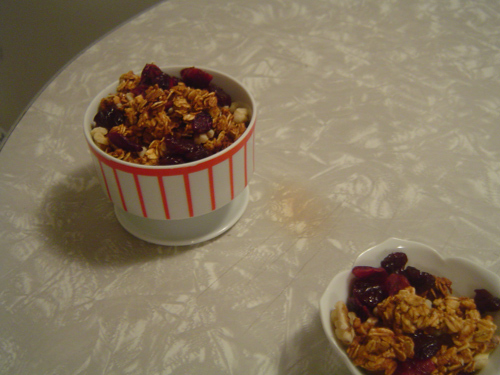 I mixed in some dried cranberries + dried cherries to make this extra delish this time! Aw! you got the little package the day before your birthday!? Awesome! Happy Belated Birthday! I think you’re lovely. Cool!! I LOVE that she wrote you a note.. I think YOU are lovely too!!! Thanks Joy! YOU are the lovely one though!